My guide failed to mention that to get to our mountain, we have to cross another mountain first. Hours of straight uphill, and each time I think the top is just ahead, another higher top appears. Mountains? What was I thinking? Just when I think I will have to lay down beside the track and die in my boots, we reach the top of the first mountain and start heading down. 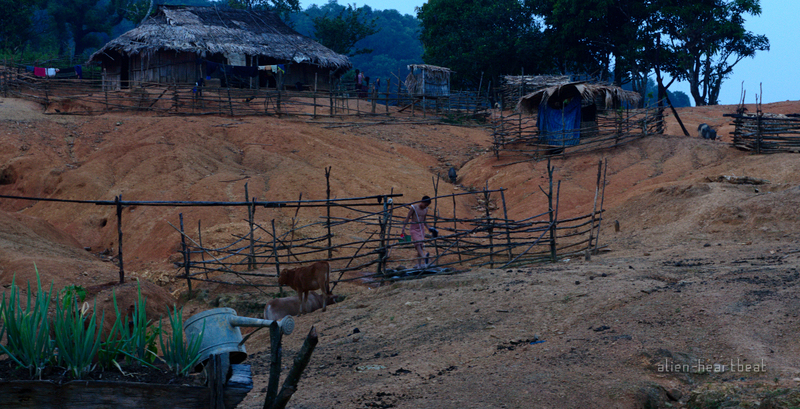 After a few hours we reach a Hmong village where we will stay the night. 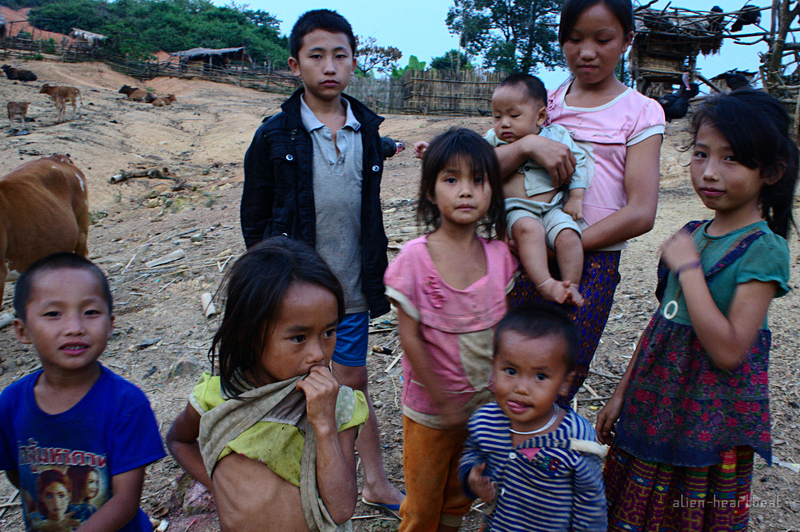 The Hmong have had a bad deal from history, most recently helping the Americans during the Vietnam War (known here as the “American War”) and then being largely abandoned to the victors. This village is 5 families, about 21 people, plus about 50 assorted cows, pigs, chickens, ducks and turkeys, with 5 shiftless dogs and a few miserable cats. 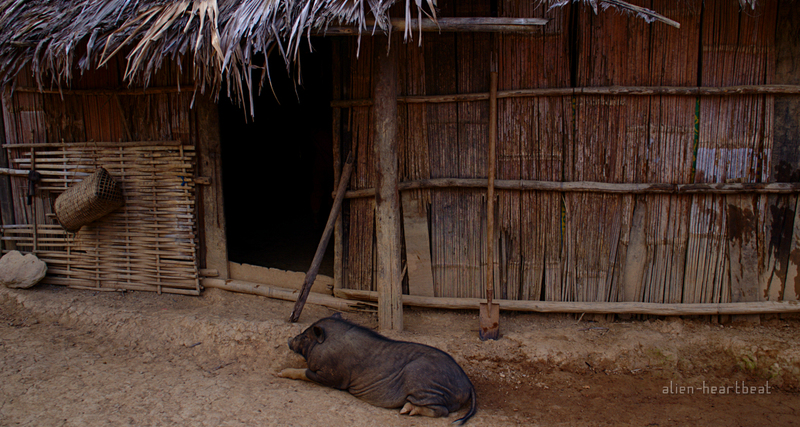 The Hmong prefer top keep their animals close by (unlike the Khmu who let them roam more freely) and with so many animals roaming around there is no grass, just mud and dung. I take my own shower. Showering with your pants on has the huge advantage of washing your pants and yourself at the same time. Hmmm. That pig looks like she is playing the part of the guard dog. no, just guarding her options, waiting for opportunity. Hello, Michael. Been wondering where you are, and how you’re doing. I’m glad comments bring your blog into my reader. Have you read, “The Spirit Catches You and You Fall Down: A Hmong Child, Her American Doctors, and the Collision of Two Cultures”, by Anne Fadiman? It’s incredible, and from what I understand, required reading for (US) med students. Hope you are well, and the very best wishes for 2014. Hi Victoria, have been spending Christmas with family and friends so had fallen behind on both posting and reading. Had a look at “The Spirit Catches You and You Fall Down” but put it down soon. I see and hear so much sadness I try to avoid reading about it also. I try to read books / go to movies with happy beginnings and happy endings (and preferably happy in the middle). The exceptions I make are usually of great significance, eg Anne Applebaum. All the best for 2014. Understood, and agreed. The Spirit was on loan from the library. I didn’t finish it, or renew the loan. The first half made quite an impression, as I’d not known of the amazing Hmong people prior to that book, but could completely relate to their experience with western medicine. I’ll have a look at Anne Applebaum. Thank You. The Anne Applebaum book I read was “Gulag”. Every miserable inhuman detail of the gulag system annotated. I could read only a page at a time, but the history dragged me, to the end. She has since also published a history of the iron curtain cpoming down. When I was eleven, I came across a book from my mother’s bookshelf. (Nancy Drew could never hold my attention.) It was written by a woman who was a doctor, about her time at Auschwitz. It was then, and how, I learned about that part of history. There is no doubt of its profound effect, forever, changed my being. Was listening to “Spoonface Steinberg, by Lee Hall, on BBC radio the other day… The wise little girl said, “The saddest things fill you up.” I’d never looked at it like that before. It’s an incredible play, if you ever get the chance. “The saddest things fill you up.” a summary that is both beautiful and complete. eating is the easy part. your adventures need strength (mentally and physically)! Strength is one way to get through them. The other way is just Persistent Stupidity. There is a very large body of opinion (in particular, and unanimously from members of my family) that I use the 2nd method. the gaze of the boy in the centre of the first photography…lingers for me…layers of stories in this post…lovely photos. 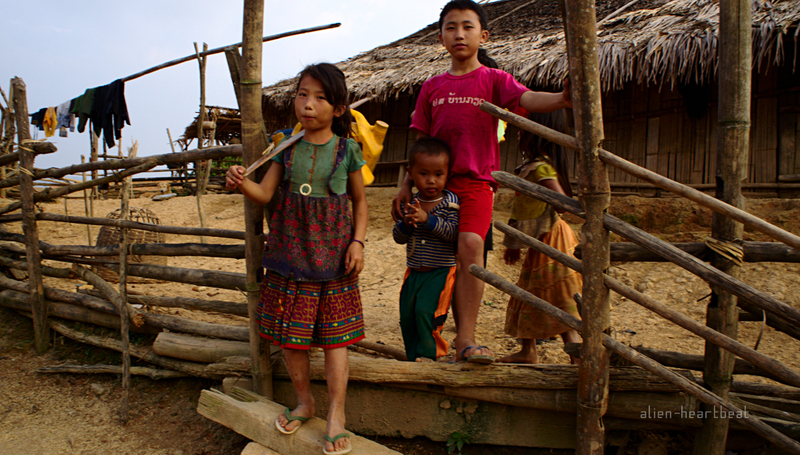 yes, these children were less unreservably friendly than most children. They did smile at times, but not as much as you would expect. 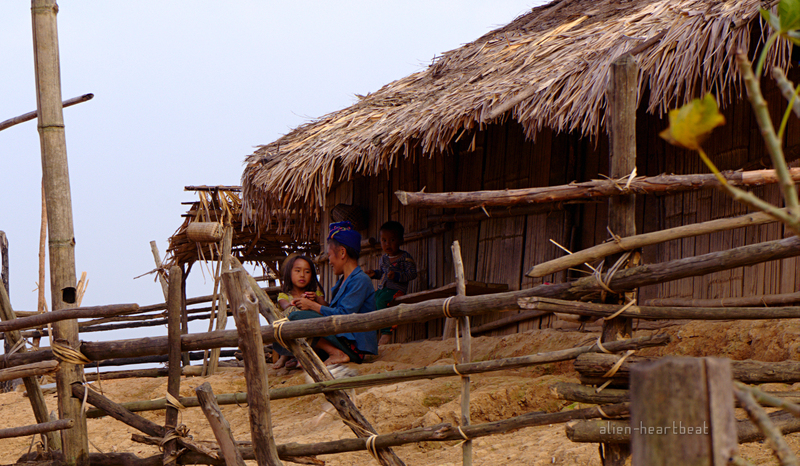 The Hmong way of life is so rich and steeped in tradition. Your photos are beautiful and I’m sure, your journey must have been unforgettable. It is true; however over the last 40-50 years, they have been victims of terrible historical forces. Good story and photos. The “American War”. That’s a little food for thought. Thanks for sharing. Thanks. A war, you would think, would be (in most cases) a simple issue, but the huge vaiety of opinions, even the different names for the same war, dispute this. These are breathtaking photos accompanying a great post. What gets at me is the sadness surrounding this village and its people as something the world has forgotten. What has made you stop blogging? I wish I could answer that clearly, even for myself.